Certified in Spring of 2003. I guide over 150 trips a year. I have been lucky to have fished most of Colorado and portions of Utah, Wyoming, and Montana; the Gulf of Florida, the Outer Banks, Nassau, and the Virginia River Valley. I have caught everything from small mouth bass to northern pike, salmon, tarpon, redfish, sea trout, and the goliath grouper. My first tarpon from a kayak off the shores of Pine Island, Florida. A summer in Alaska exploring the rivers and rippin lips! Skiing/Snowboarding, Mountain Biking, Rafting, Camping, and a general passion for the great outdoors. Whether floating the Upper Colorado, or wading the unpredictable Eagle River, I am always looking for the next big fish. As a guide, I enjoy creating an educational experience with easy-going instruction. Watching a young angler progress with my guidance is so gratifying. For the advanced angler, I find the challenge of pushing their skill set to the next level as rewarding as catching the fish myself. But in the end, it is just fishing, and I think I have the best job in the world. “Great time! Rob is a first class guide who did a fantastic job! Can't wait to go again. 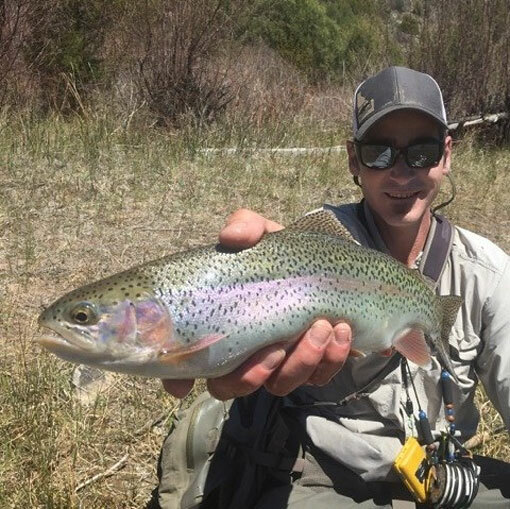 Vail Valley Anglers is the best! Much appreciated. “Everything was excellent! Rob was a great guide! Will definitely come back in the future. “Just wanted to let you know how much we enjoyed Rob. He was patient, interesting, professional a genuine pleasure. We had a wonderful two days and I thank you very much. He is a fine young man with a great sense of humor and really knows his stuff. Look forward to going fishing again soon.